The speaker at the June meeting was Sandie Lush and it was a most entertaining and informative evening. Sandie is an award winning quilt maker who specialises in hand stitched wholecloth quilts, some of which feature hand applique, colonial knots and beads. Her work has won prizes at many exhibitions, both in the UK and overseas. 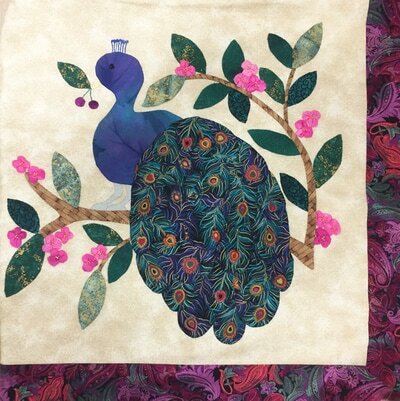 She also designs and produces a range of wholecloth patterns. Her talk was illustrated with slides showing her wide range of work. Sandie had brought quilts and smaller pieces for us to look at, including quilts that look exactly like cricket sweaters. 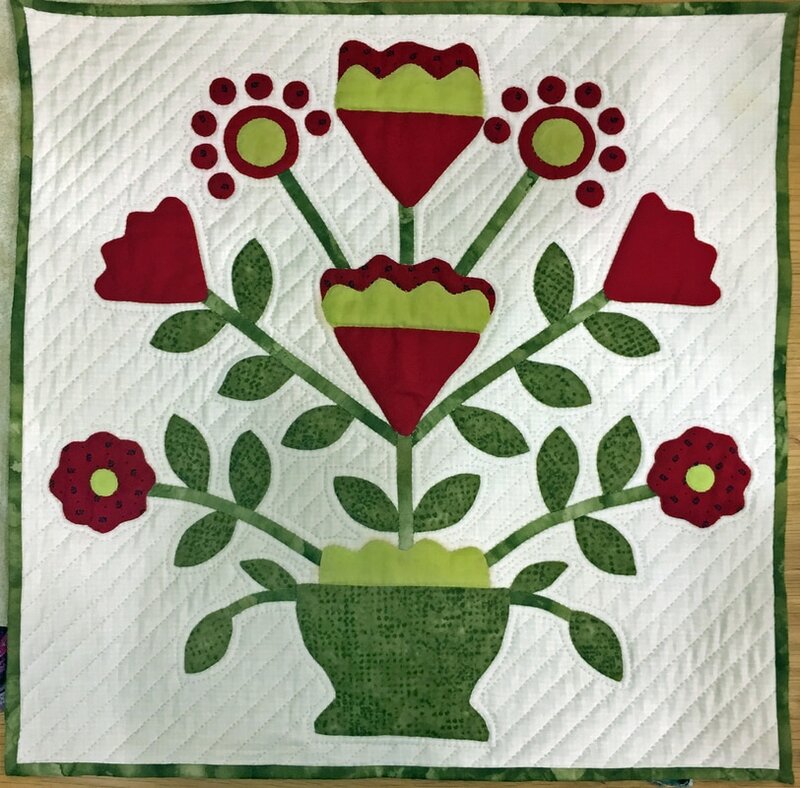 Sandie told us that she was introduced to patchwork and quilting when she lived in Massachusetts in the early 1980s and began making patchwork quilts in the 90s on her return to the UK. 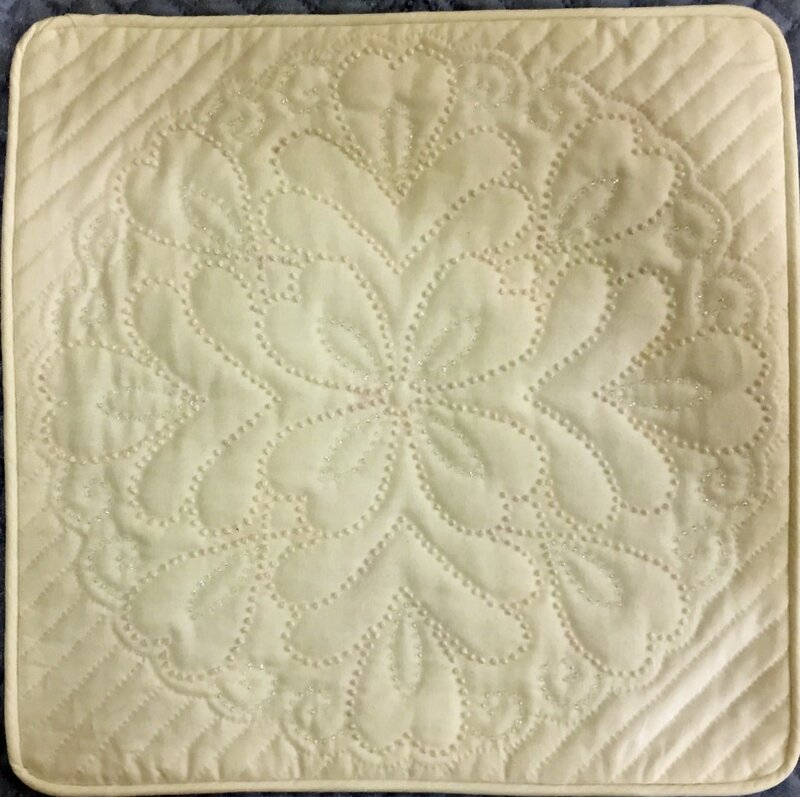 She attended a hand-quilting class with Barbara Chainey who taught her how to "rock and roll" and this was the start of her long lasting passion for hand quilted wholecloth. During the talk she showed us slides of her beautiful award winning quilts including her "No More Berries" quilt which has 1,076 appliqué pieces in the border! 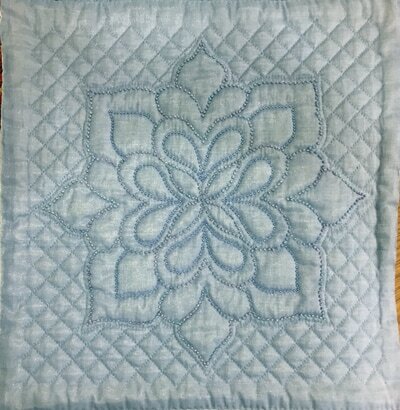 I went to Sandie's workshop the following day. It was every bit as good as I expected and I really enjoyed the day - I think everybody did. 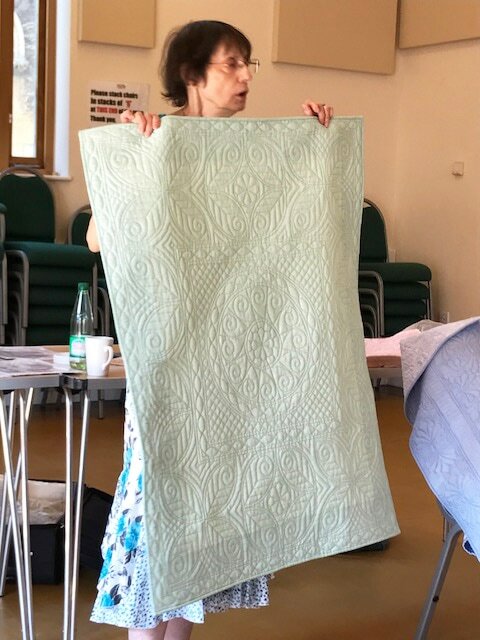 The workshop was essentially for beginners in hand quilting, but those more experienced could create their own design instead of stitching. 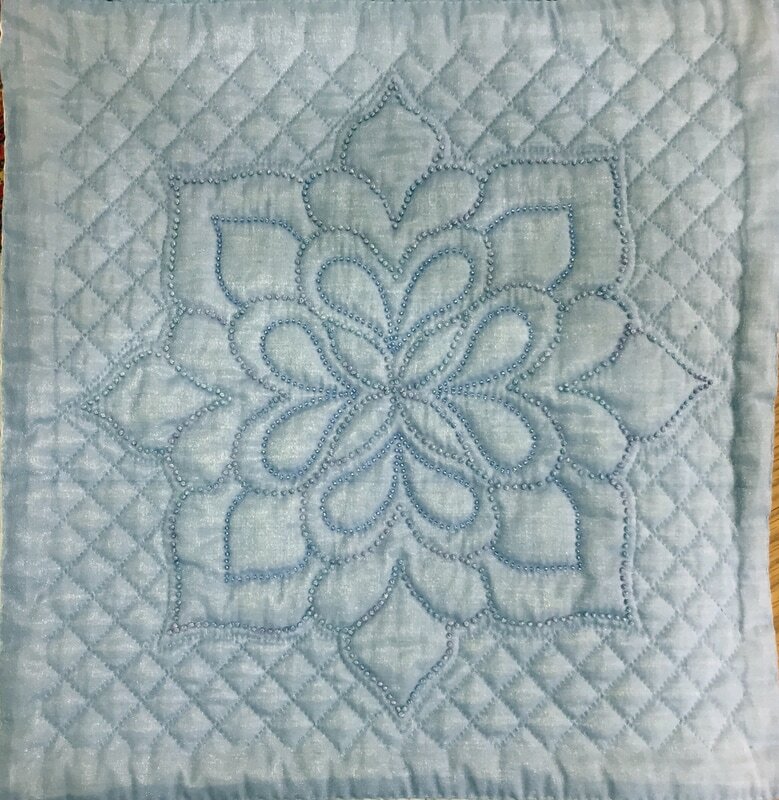 We all chose to hand quilt a small piece from a range of Sandie's own wholecloth cushions patterns. 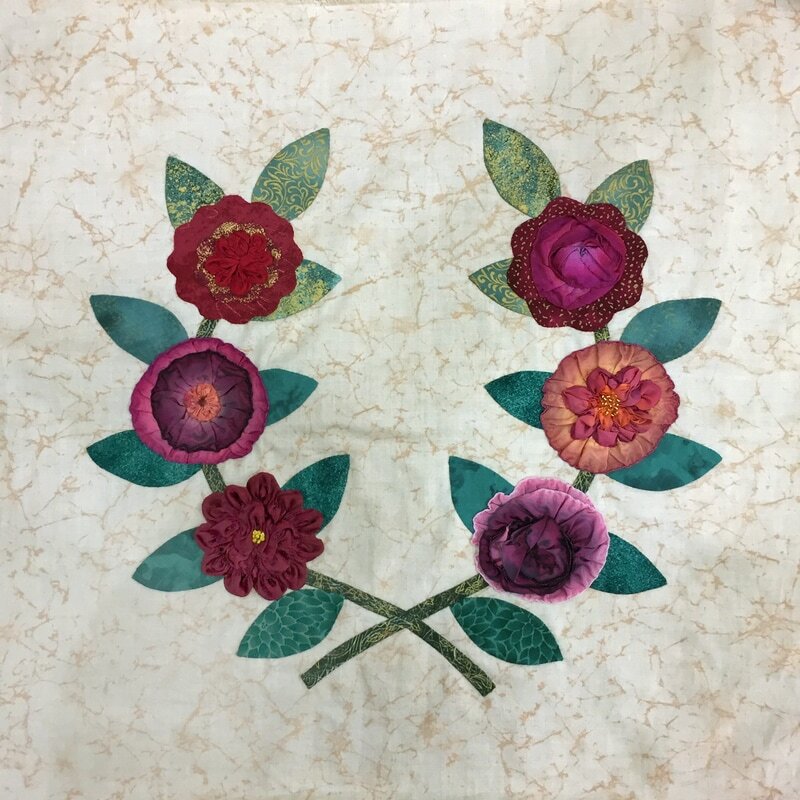 Sandie advised extensively on choice of fabric: Oakshott cotton, polyester Charmeuse satin, silk dupion or silk cotton work well. 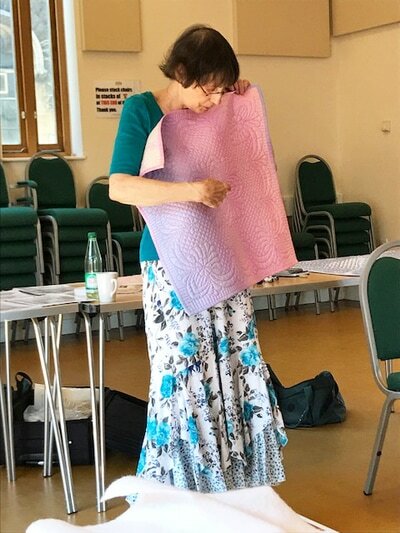 She also showed us how to test if a fabric will "needle", and spoke about her preferred supplies - fabric markers (she uses Derwent water colour pencils), threads, wadding (Hobbs Polydown 80/20) and stitching. Her advice was very thorough and informative, and she gave us lots of tips. 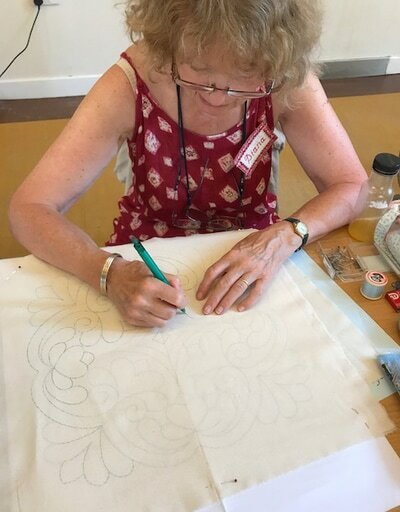 Having chosen our pattern we then traced the design onto the right side of the top fabric, sandwiched it all together, then tacked the three layers in a 4" grid. 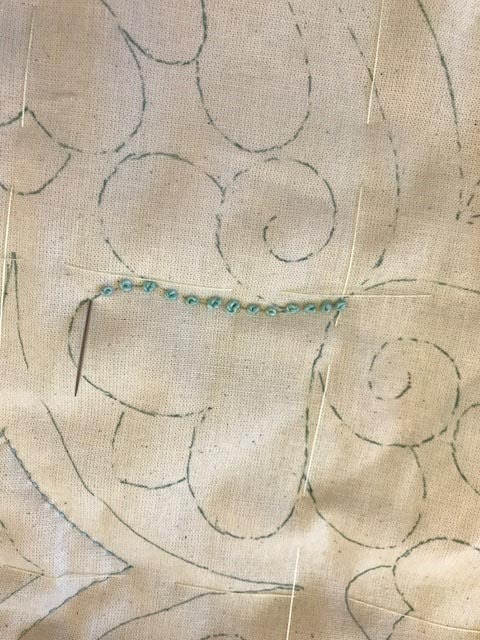 Achieving evenly sized running stitches is not as easy as it might look! (Sandie can do an unbelievable 17 stitches to the inch). I only managed to complete the centre part of the design but I definitely want to finish it. I might even add some of Sandie's beloved colonial knots - these little beauties are similar in appearance to the French knot, but superior in every way. I think everyone enjoyed the day very much. Sandie gave us so much information, and I came away with a fuller understanding of what to do. 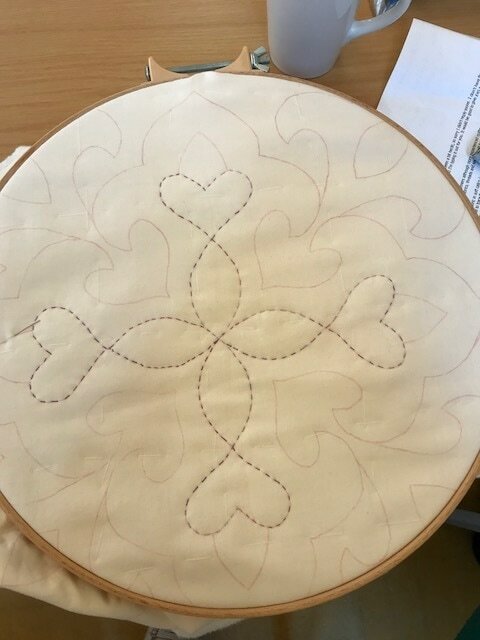 I hope to finish my cushion soon.